Nino and Anna Mazzola started it all! Married in 1967 Nino came to the United States to work as a mason on the World Trade Center, before reuniting with his bride in Brooklyn. In 1970, eager to leave the construction business, he bought a pizzeria in the small suburb of Midland Park, NJ. With no prior training as a pizzaiolo, what Nino lacked in experience he more than exceeded in dedication. Before long his business was flourishing. In those days, Brothers Pizza was truly a “Mom and Pop” shop with Nino out front making pizza’s, and Anna waiting tables and running the kitchen. Nino and Anna raised their three children, Vera, Piera and Anthony in Hawthorne. While Nino no longer works the 80-hour weeks of his younger days, he is often found on Friday nights making pizza and manning the ovens. Anthony Mazzola was indeed born to be a Pizzaiolo. The only son of Nino and Anna, he studied the craft of pizza making under his father’s guidance from a very young age. Anthony’s cooking style comes from his mother, who instilled an appreciation of traditional Sicilian dishes with an emphasis on simply prepared quality foods. Many of these recipes and techniques have remain unchanged throughout the past 40 years of Brothers Pizza. Although he earned a B.A. in International Business, Anthony always remained a true Pizzaiolo. Under his direction, Brothers Pizza has continued to thrive, and in 2012, it had completely outgrown its original space. 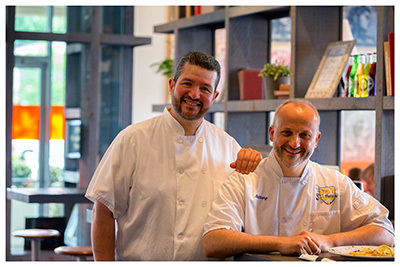 This prompted the move to a larger store, and the founding of Pizzaiolo Brothers. Anthony lives in Bergen County with his wife Jennifer and three children, Julia, Amelia and Anthony. always drawn to the pizza business, working at his cousin’s pizzeria on the weekends. It was there that he mastered the Sicilian style of pizza making that truly distinguishes him today. Robert developed his approach to cooking from his parents, Franca and Antonio Mannino, who imparted in their son the value of fresh, seasonally available foods with a dedication to traditional Sicilian influences. Robert and Vera moved back to the US in 2000 and joined Anthony at Brothers Pizza. Robert quickly proved invaluable and his culinary expertise can be seen in numerous dishes proudly served today. Robert and Vera live in Passaic County with their two sons, Antonio and Alessandro. Vera Mannino is the lady of the house at Pizzaiolo. She is married to Roberto and is the oldest daughter of Nino & Anna. Often working long days along side their father, Vera and sister Piera truly helped Nino establish himself and achieve success in the early years of the business. During an annual family trip back to Sicily, Vera met Roberto and the two were soon engaged. Roberto and Vera lived in Sicily for the first 10 years of their marriage. It was during this time Vera blossomed into the gifted cook she is today. Seamlessly blending the influences of both her mother and mother-in-law, Vera’s cooking is classic Sicilian. After moving back to America in 2000, she and Roberto returned to her family’s business. Many of Pizzaiolo’s offerings are Vera’s recipes, perfected at home and then shared with our customers. Vera and Roberto live in Passaic County with their two sons, Antonio and Alessandro. Pizzaiolo--an equal opportunity employer--is always looking for enthusiastic and qualified help. 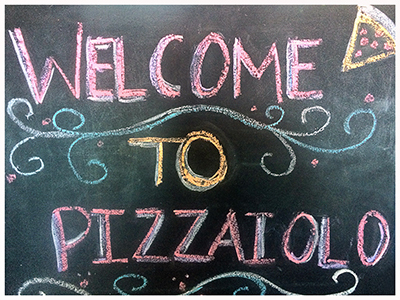 Pizzaiolo is a family owned business and when you work here, you become part of the family.